To some, a beer is a beer is a beer. To others, saying that phrase is akin to a sin because all beers are not created equal. There is a growing group of folks across the country who are happy to see specialty beers become staples at many stores and eateries. 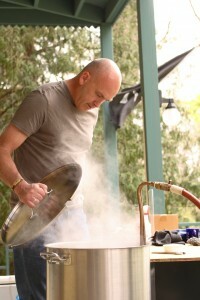 Inspired, some are even brewing their very own craft beers at home. 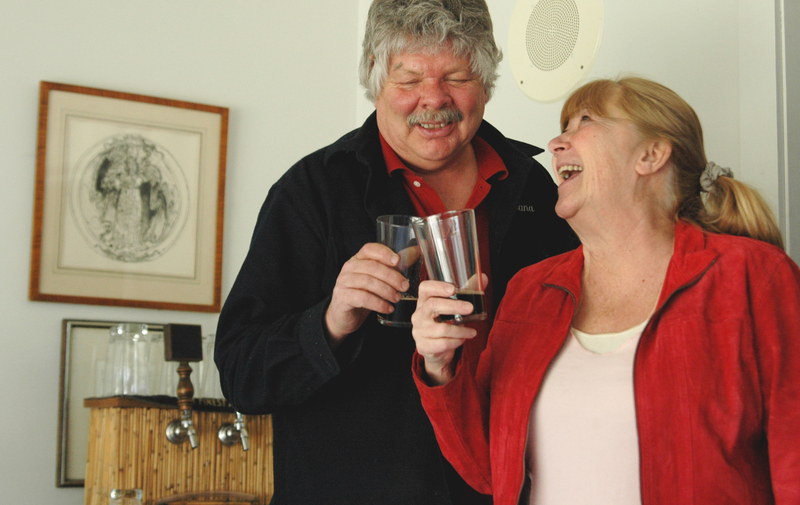 Locally, the Kosciusko Kettleheads are one such group of beer-loving individuals. “We all remember that moment when we first realized beer could be really good — that there’s more than just domestic lagers out there,” said Aaron Winey, who has been brewing his own beer for two years. Winey’s first “good” beer was a Newcastle. Since then, he’s been hooked on brewing. Winey says brewing beer is really as easy or as difficult as someone makes it. Using a set recipe is a good idea for a beginner. From there, beer consists of four main ingredients: water, yeast, malted grain (like barley or wheat) and hops. These items are boiled and then fermented anywhere from one to three weeks before they’re bottled or kegged for eventual consumption. While some specialized equipment is needed, basic starter kits are available for less than $100. While making beer on the stove top is possible, it’s nice to have some space to brew, too. Rich’s favorite home-brews are strong German wheat beers and Belgian honey beers. 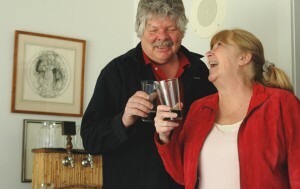 He usually brews about five gallons of each variety at a time and has three taps at home. In the winter, he steers for the more malty, strong, full-bodied beers while summer calls for lighter, hoppier beer, he says. At 3 p.m. on the second Sunday of each month, all the Kettleheads get together at Mad Anthony’s Lake City Tap House in Warsaw to share and critique their latest home-brews. Anyone interested is welcome to join the group, to talk brewing or taste. The next meeting is Sunday, April 14. For Dana and Kathy Cone, who live near Dewart Lake, brewing beer started after discovering their college son’s brewing equipment in storage. Four years into making their own beer, the Cones now have an outdoor Tiki bar with four or five varieties of beer on tap — much to their neighbors’ and friends’ delight. They also grow hops on an outdoor trellis system. From stouts and lagers to Irish ales and English ales, they’re fans of many varieties. Recently, they aged one kind in a former whiskey barrel, giving it a great, full-bodied flavor. Upcoming special events for the Kettleheads include a Big Brew on Saturday, May 4, where the brewers will bring their equipment to one spot and brew together. The Kettleheads’ third annual Homebrew Tasting will take place Saturday, June 15 at Cerulean in Winona Lake. Proceeds from that event go to Combined Community Services. For more information on home-brewing or the Kettleheads, call (574) 265-4837 or email [email protected] They also have a Facebook page.